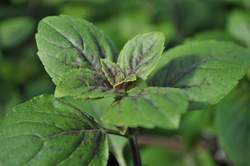 "Ocimum kil.x basilicum 'African Blue'"
Dark green foliage has purple veins and a spicy camphor scent. One of the larger basils, African Blue is well known for its beautiful purple flower spikes and is often used in the landscape for its ornamental value. 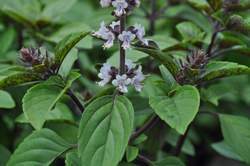 A bit milder form of basil, it is wonderful for culinary uses such as oil and vinegar infusions. 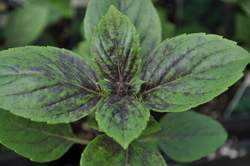 Plants require moist, well-drained soil.